Manuel Reyes Alfonso, executive vice president of MIDA offers details of this year's Consumer X-Ray. Manuel Reyes Alfonso, executive vice president of MIDA offers details of this year’s Consumer X-Ray. Puerto Rico consumers have changed their priorities and frequency in purchases, focusing their expenditures on the necessary and establishments that offer the best bang for their buck, this year’s Consumer X-Ray revealed. 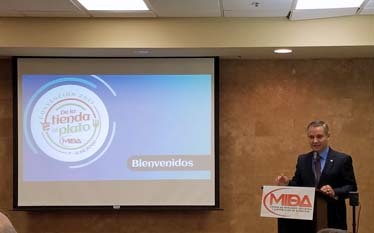 The study, now in its 25th edition, is conducted by the Puerto Rico Chamber of Food Marketing, Industry and Distribution (known as MIDA by its Spanish acronym) to gauge consumer behavior. The research has allowed retailers to develop marketing strategies over the years, trade group officials said Tuesday during a news conference. “The X-Ray shows us this year a consumer who has changed their priorities and frequency of purchase, focusing spending on what is necessary and the channels that provide them with greater results, such as supermarkets,” said Manuel Reyes Alfonso, executive vice president of MIDA. “This shows that the strategies the food industry has followed to survive the constant ups and downs and provide the consumer with alternatives that meet their needs have been successful,” he said. This year, the study identified a consumer that has evolved before the uncertain and changing economic reality. The study’s full results, commissioned market research firm to Ipsos, will be presented on June 8 at MIDA’s annual convention. The study presents five main findings that reflect the evolution of the consumer: change in consumption, resurgence of the supermarket, the search for value, and emphasis on consumption in the home and health. Changes in consumption include buying what is strictly necessary as the main measure to reduce spending on food purchases — 29 percent of people are buying only what is necessary, contrary to the 6 percent last year. Consumers also buy what is on sale and have reduced the amount of products they buy. This year MIDA evaluated the phenomenon of offers in multiples (i.e. : 4 items for $ 1.00) and found that 33 percent will stop buying other products to take advantage of the offer and 36 percent modified their home’s menu for such offers. In general, consumers are more budget-conscious and buying what they need, keeping prices at the forefront when deciding what to buy, said Freddie Hernández, chairman of the Consumer X-Ray committee and general manager of P&G. Grocery stores outpaced other retailers when it came to the consumer’s favor. The total monthly expenditure for the supermarket channel increased by 11 percent as well as the frequency of visits, the study showed. Average spending increased from $406 in 2016 to $458 in 2017. On the other hand, the average number of visits to the supermarket increased from 4.65 to 5.17. In contrast, 30 percent of consumers reduced visits to the pharmacy channel for food purchases. By 2016, average visits to pharmacies were .73 visits and 2017, .45 visits per month. Compared to 2015 with 1.03 visits per month. On the other hand, 80 percent of consumers buy food in the supermarket, but only 29 percent use the channel to buy non-food, representing a great opportunity for supermarkets, Reyes-Alfonso said. Pharmacies and department stores carry about 60 percent of non-food sales (cleaning and personal care products, among others), the study showed. The X-Ray showed a consumer that is constantly seeking out value, using store circulars as motivators to visit the establishment. The study showed that 22 percent of consumers prefer manufacturers coupons in digital form or via a coupons app. The use of manufacturers coupons has been on the rise in recent years, according to results of prior editions. Hey Buddy!, I found this information for you: "MIDA’s Consumer X-Ray finds price-conscious buyers". Here is the website link: https://newsismybusiness.com/consumer-conscious-buyers/. Thank you.